Director – Ava DuVernay, Screenplay – Jennifer Lee & Jeff Stockwell, Based on the Novel by Madeline L’Engle, Producers – Catherine Hand & Jim Whitaker, Photography (3D) – Tobias Schliessler, Music – Ramin Djawadi, Visual Effects Supervisor – Rich McBride, Visual Effects – Crafty Apes, Digital Domain (Supervisor – Nikos Kalaitzidis), Industrial Light and Magic (Supervisor – Mark Curtis, Animation Supervisor – Adrian Millington), Lola, Luma Pictures (Supervisor – Brendan Seals), Method (Supervisors – Matt Dessero & Tom Wood), MPC (Supervisor – Pete Dionne), One of Us (Supervisor – Dominic Parker) & Rodeo, Special Effects Supervisor – Mark Hawker, Makeup Design – LaLette Littlejohn, Production Design – Naomi Shohan. Production Company – Disney/Whitaker Entertainment. Young Meg Murry is a bright student who is bullied at school over the fact that her father, a renowned physicist, disappeared four years ago. Her father had radical theories about a tesseract that would allow instantaneous travel across space via thought but these ideas were ridiculed by his colleagues. Meg now receives visits from three strange women, Mrs Which, Mrs Whatsit and Mrs Who, who offer to take her on a journey to find her father. Meg, along with her younger adopted brother Charles Wallace, and Calvin, a guy from school who has befriended her, join the three Mrs as they tesser to the planet Uriel. There they learn that Meg’s father has been captured by The IT, an agent of The Darkness that promotes misery and unhappiness across the universe. Meg detours to the planet Camazotz where her father is being held prisoner by The IT and must gamble all she has to save him and Charles Wallace who has been taken over by The Darkness. A Wrinkle in Time (1962) is a classic Young Adult work from US author Madeline L’Engle (1918-2007). 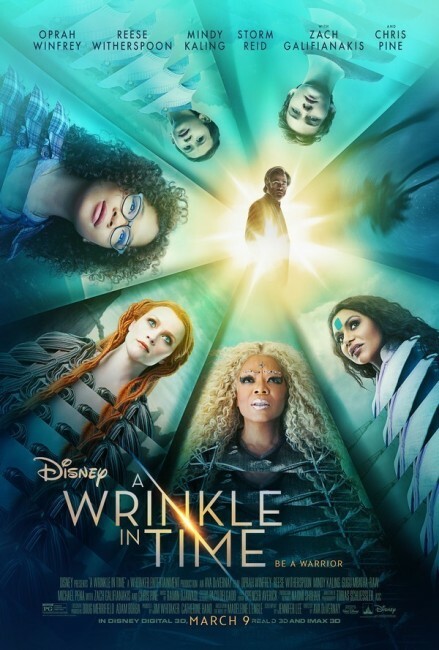 The phrase ‘much-loved classic’ is hyperbole that is badly overused by publicity departments but would appear to be true in the case of A Wrinkle in Time. After accruing rejections from 26 publishers, the book was published and went on to win several awards. L’Engle was a Christian and the book has several sections that quote from and compare to The Bible (all of which have been erased when it comes to the film). The book has been the cause of both celebration and controversy in the Christian community – some churches were not happy with L’Engle’s idea of salvation for all, which has caused the book to be banned in a number of libraries. Despite this, the book enjoys widespread popularity in the secular community and many have cited it as a classic work of their youth. L’Engle wrote four sequels and the book was previously adapted into a tv movie A Wrinkle in Time (2003), which L’Engle was purportedly not happy with. To bring A Wrinkle in Time to the screen, Disney have turned to Ava DuVernay. DuVernay is an African-American woman filmmaker who emerged through the publicity department, before directing the documentary This is The Good Life (2008). This was followed by the dramatic films I Will Follow (2010), Middle of Nowhere (2012), Selma (2014) and a further documentary 13th (2016). These saw DuVernay winning a Best Director Award at Sundance for Middle of Nowhere and Selma nominated for a Best Picture at the Academy Awards. The other side of this is that by acknowledging these deficits of representation what you end up with is tokenism – you can guarantee now that every awards season is now going to have to have at least one Black director or one woman director among its nominees. Not saying their work is not excellent in itself but what you end up with is the effect that one chair among the nominees is now reserved to be filled by director of x group rather than five seats for the best actual directors of the year irrespective of what gender and ethnicity they are. The harsh reality is that Black and women directors do not helm a majority of the films made in Hollywood. This is the oversight that needs to be corrected as opposed to promoting one segment of the population at the awards ceremonies over and above the percentage of total contributions they make. And beyond that, why should only these groups be singled out – why are we not getting calls for more LGBT, more Asian, more Polynesian directors and actors? This kind of representational nightmare ended up nearly derailing the Hugo Awards in recent years with the so-called Sad Puppies controversy. The flip side of the coin is the Milos Yiannapolis’s of the world and the vile campaign conducted against Ghostbusters (2016) for daring to recast the original with all-female leads. There have been similar kinds of bigotry-driven campaigns conducted mostly on social media against the greater diversity in the third Star Wars trilogy or the casting of Jodie Whitaker on Doctor Who (1963-9, 2005– ), all of which have been reactionary stances against the messing with canon. Hollywood has leapt on board the diversity bandwagon with ideas that just seem lame-brained. You get characters like Professor Dumbledore and Lando Calrissian who are suddenly retconned as LGBT even when such amounts to no more than token acknowledgement but nothing on screen that actually shows them engaged in such. Or the recently touted ideas of a female James Bond or Indiana Jones, which represents such a complete wrench away from what the characters represented that they would no longer be the same as the original. Beyond that, I would question if it is an outrage to recast an ethnic role with a white actor in films like Gods of Egypt, Ghost in the Shell and The Hunger Games (2012), why is it suddenly diversity when A Wrinkle in Time recasts a lead character that is written on the page as white skinned and red haired as a mixed race child? It is either a case of you pay respect to the original conception, which is part of the point whitewashing wants to make, or else you end up with a set of double standards that say whitewashing is only bad when ethnic characters become white but is to be celebrated as good when it goes the other way and white characters are suddenly recast as ethnic to fill a perceived diversity deficit. You can see the way my head is spinning trying to make sense of these double-standards. All of which brings me to A Wrinkle in Time, which serves to only do diversity in a bad way. It is a film that takes a Young Adult work that was celebrated by millions and shoehorns it onto a vehicle for modern diversity concerns. Now, the Murry family is ethnically mixed, Meg bi-racial. Of all the characters we meet throughout, there seems the intention to be as mixed as possible. The list of works that Mrs Who quotes has to be altered to drop all the Biblical references, while the list of great thinkers of the century has been changed to add Maya Angelou and Nelson Mandela. More crucially, all of the publicity that Ava DuVernay made during the film’s pre-release was about how she was making a work that celebrates diversity. Almost entirely neglected was the fact that they were adapting a much-loved children’s tale. If you were one of the kids that grew up enjoying the book, what I think you would have watched the film for is seeing the book brought to life, not be lectured about racial acceptance. I have no problem with Ava DuVernay wanting to make a film about mixed race couples; it’s just that she approaches a classic work with a series of political issues the size of Mrs Which and determines to make an issue about it that totally drowns out the story. None of this would have mattered if A Wrinkle in Time was a good film. I haven’t read the original book so don’t feel I can speak to the changes – certainly, many around the web who had read the book were not happy with the results. (There’s a solid article at Slate that goes into the differences). I can’t really spend too much on A Wrinkle in Time as being science-fiction either because, though it appropriates the genre’s tropes, it is not a science-fiction story. Madeline L’Engle’s inspiration was C.S. Lewis’s Christian allegories and the Mrs’s construed essentially as angels, while elsewhere we get concepts that belong more in a work of fantasy such as Zach Galifianakis as a seer and an all-embracing evil known simply as The Darkness, which seems like something out of The NeverEnding Story (1984). The film pays lip service to science-fiction with talk of quantum entanglement as an explain-all for teleportation but this is no more than the way in which New Age nonsense has taken an idea about uncertainty in physics and turned it into quantum woo. 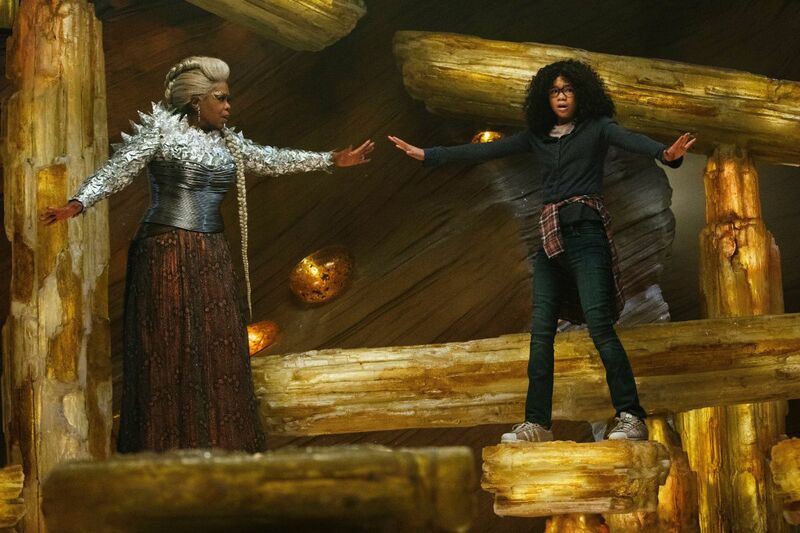 A Wrinkle in Time is a fantasy made by people who think that eye candy, extravagant costumes and colour equals depth. When people turn up Oprah Winfey and Zach Galifianakis outfitted in absurdly over-the-top gowns, jewelled eyebrows and man buns you are wanting to break out into laughter. Although that is not quite as ridiculous as some of the scenes that involve Reese Witherspoon turning into a giant-sized cabbage leaf so the children can fly on her back. Or a scene where Zach Galifianakis requires everyone to form a circle on floating rocks then stand on one leg and think happy thoughts. These are scenes that belong more in a film for the Under Five age set – it makes ‘A Wrinkle for Time resemble something more like Teletubbies. The plotting is so hurried during the Camazotz scenes that you just sit wondering why you are watching a bunch of kids bouncing balls in unison – for that matter, why there is a suburban street scene on an alien world – without gaining any sense of Madeline L’Engle’s notion that she meant the scenes as a statement about conformity. 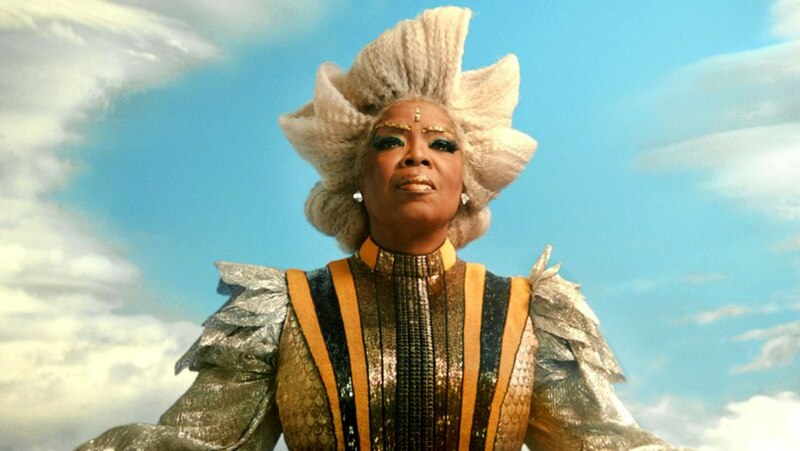 I suppose though the biggest sin that A Wrinkle in Time conducts is that it turns Meg Murry into the biggest Mary Sue in science-fiction cinema. The term Mary Sue grew out of Star Trek (1966-9) fan fiction where the usually female author would write themselves in as stunningly gorgeous, supremely talented and all sorts of superlative attributes who would then attract the attention of Captain Kirk and/or the object of the author’s desire and be swept off their feet. The term Mary Sue has become a stand-in for the central character who is regarded as amazing and is granted incredible abilities by the author without actually having to earn them or demonstrate said amazingness. Meg becomes one of the worst examples here. We are told that Meg is a brilliant scientist – but never actually see her engaged in any at school. She goes on a journey to find her missing father and stands up to the force that has taken over her brother, which seem to merely involve telling him that she loves him and celebrating her faults. The Mrs’ have also given her a pair of magic glasses and told her from the outset the things that she needs to beat The Darkness. The struggle against The Darkness’s mind control becomes a battle of CGI eye candy without any feeling of dramatic stakes or a struggle that she has to earn. For this, she is somehow compared to thinkers like Einstein, people who suffered decades of cruel repression like Nelson Mandela and those who stood up to an entire empire like Gandhi. It is a climactic scene where the accolades poured on one average girl who hasn’t done much more that set out to find her father aided by all-powerful, all-wise angels who have told her what to do all along becomes utterly ridiculous in its hyperbole. Now if there was only a petition you could sign up to prevent Ava DuVernay from touching Jack Kirby’s New Gods saga, which is her next threatened film project. Not that I care as much whether the entire saga gets recast with black, white, green or orange faces, or even if DuVernay rewrites it to make the character of Beautiful Dreamer (her stated favourite) into the central figure, but the thought of Kirby’s beautiful artwork and complex mythology reduced to the banality of A Wrinkle in Time makes me want to cry inside.